War of Wages part 1 – Apples and WalMarts – Put A Number On It! There’s an old saying: “If you want to hear a dumb opinion, ask someone their thoughts on the minimum wage”. It’s the ultimate Dunning-Kruger topic – so complex that everyone thinks it’s simple, so hard that everyone has an easy answer. In a series of three posts, I’m going to describe a few economic approaches to analyzing minimum wage laws. Broadly, economics is the study of how people get what they want by interacting with each other in non-violent ways. If you want an apple and you pick it off a tree in the wild, that’s not economics because no one else is involved. If you want my apple and you stab me and take it, that’s not economics either. If you want me to give you my apple, we have entered the realm of economics. Workers want a lot of things from employers. Mostly they want wages, but also a pleasant workplace, stability, good conditions, and respect. Employers want several things from workers too, mostly labor but some of the above as well. How they deal with each other is thus a matter of economics. Even if we’re interested in the moral and political implications (which I’ll also touch on), we have to first understand as well as we can the economics of employment and wages. I won’t keep you in suspense – I think that minimum wage laws are a huge mistake, both economically and morally. I have 95% confidence that low-skilled workers would be much better off on all accounts if the minimum wage was repealed and replaced with any half-sensible form of redistribution. Redistribution that is even 3/4 sensible, e.g. negative income tax paid for by increased taxes on corporate profits, can make rich and poor Americans alike better off. If the minimum wage is repealed with no additional redistribution there would be a lot of short term pain, but I still think it’s more likely than not that workers would be better off in the long term. With that said, my goal isn’t to write a polemic against the minimum wage, but an overview of increasingly sophisticated ways to think about it. I personally find that as economic thinking gets more sophisticated, it turns less in favor of the minimum wage, but you may not. I think that there’s progress to be made in replacing stupid opinions with less-stupid ones, even if the policy prescription remains the same for the time being. So if my essay isn’t convincing, I hope that it’s at least educational. Unfortunately, our journey of increasing economic understanding has to start from an argument from which this understanding is entirely absent. This argument is so senseless than even debunking it isn’t going to be very educational. The only reason I have to address it is the frightening popularity this argument has gained recently with many of my friends and with a certain US senator. The call is to force WalMart to raise its minimum wage to $15/hr, because some percentage of their employees use government assistance. Senator Sanders in particular claims that giving Medicaid and food stamps to Walmart employees amounts to welfare for the Walton family, and that the latter should pay their employees out of their own $100 billion in accumulated wealth. This line of argument is entirely unconcerned with numbers, but the numbers are all right there on WalMart’s annual report. WalMart makes $15B of profit on $480B of revenue, for a minuscule 3% profit margin. It has 2.3 million employees. Let’s assume that 2 million of those earn WalMart’s current $10/hr minimum or close to it. If their wage was raised to $15, that would mean a $5 per hour raise. With 40 work hours in a week that adds up to $200 per week, or $10,000 per year per employee, or $20 billion total for all of WalMart’s workers. $20B is more than WalMart’s entire net income. There is simply no way for a company with such tiny margins to increase its costs without transferring the entire increase to prices. Even if the Walton family wanted to pay the higher wage bill without raising prices, the entire $100 billion they accumulated in 55 years would run out in 5. The other option is to raise prices for WalMart’s 230 million weekly customers. Most of those are much poorer than WalMart’s employees, like the 95 million adult Americans who are out of the labor force shop and earn no paycheck at all. Raising the wages of WalMart employees will result in a massive wealth transfer from lots of really poor Americans to the few not-so-poor Americans who are lucky to keep a job at WalMart. Even at $10 an hour, WalMart gets more applications per open position that does Harvard. There is going to be a lot of economic theory in parts 2 and 3 of my essay, but the simple fact that higher wages at WalMart would cause a lot of pain to a lot of poor people doesn’t depend on any of it. It’s a consequence of simple arithmetic that WalMart can’t pay anyone any wages if it goes out of business, and it can’t stay in business without raising prices to offset the rising wages. Or, WalMart can just shutter all the stores that become unprofitable with low prices and high wages and fire all the associates those stores employed. I doubt that this is going to alleviate poverty either. I’m pretty sure that it never crossed the mind of people attacking WalMart’s wages to do the math on WalMart’s income statement. I think it’s because the core of their argument is about ethics, and not about making workers richer. Unfortunately, the ethics of the argument are just as perverse as the numbers. The Copenhagen interpretation of ethics is the view that interacting with a problem makes one culpable for it. This interpretation holds that ignoring an issue completely absolves one of sin, but fixing 90% of a tragedy leaves you guilty of the other 10%. It’s an ethics that is not concerned with alleviating suffering, it is only concerned with blame and scapegoating. And as the author who coined the phrase notes, it’s a very popular moral position. WalMart is a very convenient scapegoat for American poverty because WalMart does a lot for poor Americans: it pays them tens of billions each year in salaries, and it saves them tens of billions each year in the prices they must pay for necessities. In contrast, a company like Apple doesn’t employ any poor Americans and doesn’t make things cheap for poor Americans. It has net profit margins in excess of 20% (to WalMart’s 3%), trillions of profits parked abroad, and $256 billion in cash. Apple stays away from poor people, so it can’t be blamed for their condition. The people making this argument usually have iPhones and don’t eat at McDonald’s or shop at WalMart. I suspect that many of them look down in disgust on the very act of eating or shopping there, and they want everyone else to agree with them. Unlike McDonald’s and WalMart, Apple is a world class expert at avoiding paying taxes. You couldn’t get them to help poor people even if you wanted to. I want to reiterate that “welfare to WalMart” is a weak man, the stupidest position on an issue that is still held by a significant group of people. Deflating it is not a strong argument against minimum wage laws in general, that’s all coming up in the next two posts. In Part 2 we’ll see what the much maligned “Econ 101” model really teaches. In Part 3 we’ll examine the role that wages play as a medium of information and societal organization, aside from their function as a mere contract between employer and employee. Thank you for actually thinking about an issue thoroughly instead of taking a side based on ideals. More people need to do this! Very nice. Though I wonder whether you’ll just end up preaching to the choir only. That’s always the danger, although I wonder how many in the choir have actually read Hayek (which I’m going to address in part 3). The concept “Low profit margins -> no room to absorb cost increases” is a common error. Profit margins are not related to ability to absorb cost increases. Imagine a store which employs one person at $100 per day, and sells $1 million of products per day at a profit margin of 1%. This would mean that they make a profit of $10,000 per day. Now, the wage doubles and they have to pay $200 per day. Their profit goes from $10,000 per day to $9,900 per day. Although their profit margin was small, they could easily absorb cost increases. Usually we need to look at a variety of indicators, such as employee compensation/SG&A costs, operating leverage, return on invested capital, and cash conversion cycle. Page 15: As of the end of fiscal 2017 , the Company and its subsidiaries employed approximately 2.3 million employees (“associates”) worldwide, with nearly 1.5 million associates in the U.S. and 0.8 million associates internationally. Similar to other retailers, the Company has a large number of part-time, hourly or non-exempt associates and a large number of associates turn over each year. The assumption of 2 million earning $10/hr is probably wrong, since there are only 1.5 million employees in the United States. The assumption of 40 work hours in a week may also be questionable, as they have a “large number” of part-time workers. If we use different assumptions, such as 1.2 million employees with an average of 20 work hours in a week, then this would represent an extra cost of $6 billion compared with $15 billion of net profit. Thanks for reading my comment. Probably most store associates are part time, because you have to provide benefits to full-time workers that you don’t have to give to part-time ones. You’re right, I should have been a bit more careful with the numbers. Unfortunately, we don’t have a breakdown of WalMart’s cost, except that “Operating, selling, general and administrative expenses” add up to $97B and most of that is probably salaries. In any case, a 3% profit margin is razor thin as it is, and WalMart is already sliding below that number. Whether the increase in wage expenses is $6B or $20B, most of that has to come from increased revenue which means a price increase. Unfortunately, we don’t have a breakdown of WalMart’s cost, except that “Operating, selling, general and administrative expenses” add up to $97B and most of that is probably salaries. Except the NBC article you linked to notes that “The company, for instance, has routinely poured billions of dollars into stock buybacks as part of a strategy to reduce the number of Wal-Mart shares on the market and increase the value of remaining shares,” so somebody knows something more about WalMart’s costs. Your ignorance of WalMart’s expenses don’t justify the assumptions that none of them are optional. WalMart likely prioritizes compensation for its shareholders over compensation for its employees. Looking at a single superficial number is won’t capture this nuance and cannot justify statements like WalMart can’t afford to increase compensation to one particular group it compensates. Well… the NBC article you link too directly contradicts the statement that critics of WalMart’s labor policy haven’t done the math. It appears that they’ve done the math much better then you have. You also don’t posit any evidence that these critics aren’t motivated by making workers richer. There is ample evidence that is what these critics care about. Challenging the process they use to come to their conclusion is does not challenge their motivations. You could instead be claiming that these critics are not understanding their own true motivations but you’ve also provided no evidence for this and pointed to evidence contradicting it (once again, the NBC article). This would also be a weak man that the Jason Furman paper you link to (in support of your post) takes, btw (though he does claim that the subsidization of WalMart that welfare programs provide can be exaggerated). That paper also talks about the impact that WalMart has on the labor market where a store opens and concludes that there is not a lot of evidence and the little evidence there is, is contradictory. As (according to most accounting I encounter) WalMart is the largest private employer in the United States, the store is often used as an example of labor in the United States. Someone who criticizes WalMart labor practices might be using it as an easily identified example instead of making a pointed criticism of just WalMart. In addition, the Furman paper talks about how policies like the Earned Income Tax Credit (which is in line with the redistribution suggestions you mentioned that you support) are opposed by WalMart and/or the Walton family. It also makes sense that this opposition would make these entities a target that others don’t make of themselves. In a sane world increased productivity would increase both the amount and/or quantity of stuff people have and reduce the amount they have to work. The trend during my life seams that increases in productivity are bad for those doing the work. The amount of stuff they have goes down or the amount they work they do goes up. WalMart has certainly taken advantage of this trend. The Walton family has profited but it’s (at a minimum) not so clear that either WalMart’s employees or customers (as a class) have benefited. I agree this isn’t a problem that should or could be borne just by WalMart or the Walton family but talking about these entities can provide an illustrative example. As far as a specific situation concerning WalMart and it’s labor practices if only there were a way for the company to exchange information with a group representing its employees so that they can bargain on even footing and possibly come to an agreement that balances the concerns of workers and shareholders. This still wouldn’t correct for the desperate effect on bargaining position that having a positive unemployment rate has but it would likely lead to a distribution of profits and practices between labor, management, and shareholders that people would have a harder time finding objections about. If only such an organization existed. You’ve already had to walk back quite a bit of what you’ve said. The galling thing is that you accuse others of not doing a through job of considering things only to be repeatedly caught not thoroughly considering things. So much so that you’ve just made up facts and numbers. Thank you for replying to my comment and talking about the numbers. I think that the main thrust of my previous assertion is that you have not shown that a 3% profit margin is razor thin. As mentioned, usually we need to look at a variety of indicators, including financial metrics and the relative bargaining power of Walmart, its suppliers, and its customers, to know where the cost increase will be allocated. It could be the case that Walmart’s suppliers eat the bulk of the increase, or that Walmart eats it, or that its customers eat it. The 3% profit margin is not at all related to this. Looking forward to hearing your opinion on this! If WalMart could extract a single cent of concessions from its suppliers, why aren’t they’re doing this right now? I think some of the commenters here have different assumptions about what being an actor in a competitive industry means. Making money as a business is hard. Making money as a retail business is really hard. Making money in retail when you compete with Amazon which saves money by not employing workers in actual stores is super extra hard, which is why WalMart’s margins are so tiny. Its management team is doing all it can to hold to that 3% while paying employees above the minimum wage. I have a friend who works at WalMart HQ in Bentonville, she has to fill out a requisition form for pens and notepads because the company is so obsessed already with cutting every cent of costs to stay alive. 3% is really precarious. A 3% margin means that WalMart is a tiny 3% cost increase or 3% revenue drop from shutting down and firing everyone. It means many of their stores are at close to 0%, and WalMart is indeed closing locations all the time. I think it’s quite possible that in Amazon’s world WalMart can’t be profitable at all with a $15 minimum wage, and if that happens another 2 million people will lose their jobs, probably for good. Thanks, it’s wonderful to receive a response to my comments so quickly! I agree with your assertion that a big payroll increase would not be mainly absorbed by Wal-Mart, and it would mainly be passed on to consumers. This is because Wal-Mart has a stronger competitive position than its consumers, so it can force them to absorb the cost increase. It has nothing to do with its profit margin. The shipping industry makes a good comparison. The entire industry has been bleeding losses for several years with no end in sight. Why don’t they pass on costs to their clients or to their suppliers? It’s because they are in a weak competitive position. I guess I am just disagreeing with the use of incorrect reasoning to arrive at a correct conclusion. Like if a psychology researcher used bogus statistics to support a valid thesis, we would want them to back it up with robust data. Again, why doesn’t WalMart charge higher prices today if they could get away with it? We have to assume that WalMart is charging profit-maximizing prices given the demand curve for its products. The profit-maximizing price has to go up if variable costs go up, and wages are partially variable (unlike container ships, which are pretty fixed). If it’s not obvious why profit-maximizing prices have to go if costs go up, that’s the Microecon 101 I’ll talk about in part 2. A company can internalize higher costs for a while out of long term marketing considerations, but dropping from 20% margins to 17% is very different than going 3%-0% in terms of what a company can stomach. If your stock price correlates with earnings (it should), 20 ->17 is a 15% drop in stock price and 3 -> 0 is a 100% drop. I agree that small profit margins don’t tautologically imply that cost increases are passed on to customers, and I wrote as if that’s what I meant (because I didn’t want to get into the weeds). But margins aren’t irrelevant. In WalMart’s case, they will almost certainly have to raise prices almost immediately, and if they lose too many customers as a result they will have to close down stores. The point is not that Walmart needs to pay workers fairly. The point is that labor is valued so low that a massive corporation like Walmart can basically rob the poor for such wealth. That they can push their wages down so low that it sets the precedent of “poor workers are subsidized by food stamps so there’s no problem”. It’s a precedent everyone must follow because it remains legal through unethical lobbying. It’s an ongoing trend that gets worse each year – that exploiting the poor is prerequisite to success. And heaven forbid we do anything about it, otherwise the oppressed rich people like the Walton family might lose a little bit of their fortune (ignoring that allowing such unequal wealth is anticompetitive and uncapitalistic). I like that you gave us some warning of where your post was going with your handle. 1) Do you view Walmart as some kind of monopolistic buyer of labor? Why is Walmart responsible for the low standards of living for store employees, more so than any other wealthy corporation or individual? 2) Are you opposed to anyone being on food stamps? Or are you focused on Walmart type situations? 3) Can you explain why Walmart robs its minimum wage employees, yet pays the employees that manage their logistics pipeline handsomely? Walmart is the biggest offender as the largest employer. If it wasn’t Walmart then it would be some other corporation. I don’t hold any grudge toward Walmart – they do what is legal and what makes them the most money. It’s just a shame that lobbying is such a great return-on-investment that they can further get away with this type of behavior. I would prefer if those who received food stamps received an income. People are smart and they’ll make the best decisions they can. Otherwise, food stamps are a great program. Yes, I can explain why some Walmart employees get paid living wages. It is because they have skills. Skills that poor people were never allowed to develop since being poor is too crushing of a burden. I feel like you’ve interpreted my argument incorrectly. The author of this article argued against a strawman. That Walmart specifically should be paying higher wages with no regard to legal policy is a nonsense argument no one has ever made. The actual arguments that should be written about are those of income inequality, privilege, and policy. Not some number crunch on how an integral, irreplaceable part of our Hate-the-poor-society would be unable to cope if it decided to grow a heart. I do agree with you that the number crunching is probably not getting anywhere (what is the new resulting equilibrium?). But there is no “hate-the-poor” sentiment in his post. He advocates for more effective forms of redistribution. Maybe I’ve misinterpreted your message, but your rhetoric is very aggressive and your handle is “profit is theft”. Feels like you want people to read you as a borderline out of touch lefty. Since it’s illegal to hire low-skilled workers at wages that are commensurate with their current skill levels. And if you think a low-skilled person will learn skills while working for you and become profitable eventually, it’s also illegal to bind workers to long-term employment contracts. Basically, if I’m a low-skilled worker who wants to learn skills on the job while my employer at least breaks even, I am legally prevented from doing so by the hate-the-poor society that came up with minimum wage and “worker protection” laws. Yes, you can’t just have walmart paying more for their workers. That’s unreasonable. Yes, you can’t just remove the police force (who were created primarily to defend property from the working class). That’s unreasonable. Isn’t it funny how absolutely every part of society is so interconnected and vital and unified behind the idea that the poor should suffer? Isn’t that a bit telling? The Free Market of Ideas doesn’t raise good ideas. It raises only ideas with money behind them. I feel threatened by articles that think they’ve discovered some “fundamental truth” about economics, when all they really do is circle their logic “assuming every capitalist idea we currently have (like profit is good, laws restricting markets is bad), any socialist idea is bad”. A “smart guy” like you writes about topics that defend the obscenely rich (and therefore at the expense of the poor), instead of any other topic. It amounts to a layperson examining a clock tower “Yep if you remove or change this gear, the clock tower doesn’t work. End of story” ignoring that perhaps a superior machine could be built with a different schematic. Profit is Theft, I don’t expect all of my readers to remember when I suggested my own tax rate should be higher to pay for basic income, or when I criticized an economist who tried to show that capitalism decreases inequality using flimsy numbers. But I’m at least hoping that people will read the part in this very post where I suggest higher taxes to pay for welfare. Is that idea “socialist”? I don’t care. I care that I think it would work (to help poor people) and minimum wage doesn’t work (to help poor people). I don’t hate the poor. I think that almost nobody really hates the poor. Even the “system” doesn’t hate the poor: poor people in modern free market countries do better by any measure, from health to education to material well being, than poor people at any other time and place. Is your criterion for “not hating the poor” someone who fights to burn down the system and build a “superior machine”? I fully admit to being very much against that. But if you are in the superior machine camp, I don’t think you hate the poor either. I just think you’re vastly underestimating how insanely hard it is to build a clock that works at all. -the unconscious prejudice against the poor. -ignoring or otherwise not being aware of the real results policy has on the poor . -thinking “the rich having all while the poor have not” is acceptable. From what I read of you, You probably do not ‘hate the poor’. However, your article attacks Avatar Against The Rich Bernie Sanders by name. Your [three reasons why frontrow kids like Sanders] is just an accusation of virtue signalling. Your final conclusion says “the rich were right all along. You just can’t pay people higher wages”. These are all elements of defending the rich. It’s safe to say your essay defends the rich. Especially in our political climate where income inequality is a huge issue, this is an attack on the poor. It competes in the free market of ideas. It echoes forward and causes damage to the fight for income equality. That you would write about what you call a weak argument (and I’d agree) instead of anything else reveals a prejudice against the poor (or if not yours, then it encourages a reader’s prejudice). In a vacuum, I don’t have a problem with your article. But in context, it is a damaging article, regardless the truth value of the conclusion. I think the back-of-the envelope numbers calculations might be a dead end for this kind of analysis. Can you convince people of the new (sub-optimal) equilibrium in your story once policy is put in place? 4) If you raise the cost of labor for Walmart, they will engage in less of 1). This hurts almost everyone, but particularly the low-skill employees who are out of work. One should note that there are many well known economists that support a modest increase in the minimum wage. 1) Walmart lobbies to keep out competitors who would bid up the price of labor. 2) Walmart lobbies to increase federal subsidies for the poor, so that they can keep their employees alive while paying below subsistence wages. None of the above says anything about whether or not it is a good idea to help the low-skill, low-privilege, (insert demographic you want to save). So cool it, social justice warriors. Let’s be reasonable – we care about them too. Now that would be a good reason for politicians to turn on WalMart. Anti-trust and pro-competition legislation is an important government function, but minimum wage laws are quite the opposite. It’s usually the big and established players who can afford to pay higher wages, so minimum wage laws limit competition. I’m not sure this logic works out. Standard economic theory would say that the more money you have the less you value each additional dollar. This means that if government welfare is generous, people will demand higher wages to set their video games aside and show up at work. This means that if government welfare is generous, people will demand higher wages to set their video games aside and show up at work. That’s really the argument people are making here, that in a true free market system you would have to pay employees enough to survive, or else it is effectively impossible to work for you. By that argument a person on food stamps may be able to take a lower salary and still eat. It would be like if a factory failed to properly fund maintenance of it’s machines so the government agreed to pay for a third of the maintenance cost for keeping those machines running. I don’t totally buy that argument but it’s not as irrational as you make it sound here. I can’t reply to the comment because it is nested too much. Regarding the 3% profit margin -> 0% profit margin being different from 20% -> 17% profit margin – thanks, I understand your argument and where you are coming from now. I will wait for part 2 so that I can more fully understand the whole thing. Maybe I was too hasty criticizing this part without having the whole picture. I’m looking forward to the next post, but I have a serious issue with some of the numbers. Specifically, I am not sure about the claim that WalMart saved its customers $263 billion in 2004. WalMart’s total revenue for 2004 was $258.7 billion. That number jumped out at me, so I looked into your source. I skimmed it. If I am reading it correctly, it does not say that WalMart saved WalMart’s customers $263 billion in 2004, it says that it saved American consumers $263 billion by 2004, since 1985. That by itself is a pretty big distinction. The other interesting part is how they arrived at that number. It looks like they found a negative correlation between the amount of WalMart (measure in square feet) per person in a metro area, and the rate that the CPI went up in that area. Its a pretty strong correlation (I’m just eyeballing it. I have no idea how r values work, so I’m not going to quote them). They then claim the entirety of the savings from lowered CPI in the name of WalMart. So at the bare minimum divide 263 billion by 19, and then mutter something about correlation and causation. My reading comprehension usually isn’t great this late, so somebody should check my work. Your reading comprehension is stronger than Jason Furman of NYU (the author of the original source I cited) who just quoted the numbers as “a total of $263 billion in 2004”. My own BS detector should have gone off at that number but it didn’t, and yours did. In accordance with house policy, you’ve earned a $5 gift card. Email me from the address you used for your comment to claim it. I’m pretty sure that it never crossed the mind of people attacking WalMart’s wages to do the math on WalMart’s income statement. A $15 minimum wage would put billions of dollars in the pockets of hundreds of thousands of workers across the U.S. The UC Berkeley Center for Labor Research and Education has estimated that an increase to $15 per hour for Wal-Mart employees this year would mean an additional $4.95 billion in annual income for 979,000 hourly employees. The article is clearly interested in numbers and you never address the basis of the claim that Wal-Mart can afford to raise it’s minimum hourly wage to $15 through stooping it’s stock buyback plan. I should point out that buying back stock is as much compensation to investors (and speculators) as dividends are. The annual report you cite states that Wal-Mart spent $10.4 billion on “dividends/share repurchases” (page 9). Since it reports a total net income of $15 billion (page 35) without ever stating how the $10.4 billion is accounted for, I’m thinking they include it in their expenses. This would mean it’s profit is $25.4 billion (the best number I can find and I’m not confident in it) even if for accounting purposes it’s not income is listed as $15 billion. More specifically, the NBC article takes the cost to raise the minimum wage offered by Wal-Mart at $4.95 billion and states that some of the $10.4 billion currently going to investors (and speculators) could fund this. You never address this particular argument. Instead you make a calculation that includes a ridiculous assumption (95% of Wal-Mart’s employees work 40 hours a week at $10 an hour) and bad analysis on top of that in order to make the claim that Wal-Mart cannot possibly increase it’s wages to at-least $15 an hour without passing on it’s expense to its customers while claiming that those who disagree with you are “entirely unconcerned with numbers.” The NBC article deals with the numbers on a more detailed level then you present here. Perhaps there is a reason why the analysis in the NBC article is wrong but that reason is not presented. As far as whether or not the federal government gives corporate welfare to Wal-Mart through labor policy (putting aside other forms of corporate welfare), as the Fruman paper (page 13) you initially links to point out, it does but it is easy for people to over estimate the amount it does. As tax incidence is nver 100% or 0% income taxes a paid in part by the person being employed and the person doing the employment. For the same reasons if a Wal -Mart employee receives the earned income tax credit then some of the benefit goes to the employee and some of it goes to Wal-Mart. Another particular galling aspect of this post is the attack on the motivations of those who criticize Wal-Mart. The first thing that is galling is the disingenuity of the first sentence as discussed above. The second thing is that it is impossible to read the NBC article without coming to the conclusion that authors care about making workers richer. It’s possible that their argument is flawed but that does not justify this apparent attack on their motivation. I would also say that someone who pushes a child who cannot swim into a lake then they bare more responsibility for rescuing that child then another bystander. If another bystander rescues the child then the criminal who pushed the child in in the first place has a moral responsibility to pay for the suit the bystander ruined to save the child (amongst other responsibilities). The ethical position of those who criticize Wal-Mart’s labor policies isn’t as simplistic as is presented here. Mal-Mart’simpact on poverty is complicated. I don’t know what it is. While you claim it’s impact has been clearly negative (in reducing poverty and/or its severity, a good thing) I’m not convinced and a few statistics won’t convince me while I’m aware that Wal-Mart’s impacts are wide ranging and hard to measure. This also doesn’t respect that some people may criticize Wal-Mart in that they’re merely making use the largest example of private sector labor practices in the United States. Someone who is in favor of raising the minimum wage for everybody (as opposed to just Wal-Mart) who points out that Wal-Mart could today afford such an increase is using the “Wal-Mart can afford a $15 an hour minimum wage and should be required to provide it” as a example is using it as an example without placing special responsibility on Wal-Mart. I don’t agree with this logic (it could be the case that it is easier for a large employer to respond to an increase in the minimum wage then a small employer). Also, it’s not hard to find liberal, advocacy that <a href=http://www.washingtonpost.com/wp-dyn/articles/A43293-2004Sep22.html”>corporations like Apple should pay more in taxes. Several corrections have already been made (some explicitly stated and some not). More are due. They conclusion you come to may very well be true but your post doesn’t make a good case and links to places that make a better case for positions you disagree with. It would also help to avoid the unfounded criticism of your opponents motivations and willingness to undertake quantitative analysis. I agree with you that Walmart isn’t a “bad actor” and probably does more good than harm. There’s also a longer issue where over the past few decades productivity per worker has risen a lot while wages have not. If Walmart has revenues of $480B, they could raise prices less than 5% and pay the extra $20B out of that. Given Walmart’s actual wage structure, we’re talking, maybe, a 2-3% price increase to cover paying higher wages. Most supermarkets, including ones with union workers, have profit margins of about 2-3%. That’s common in that business, and since the wage law would apply to all supermarkets, none of the others could undercut Walmart on wages. 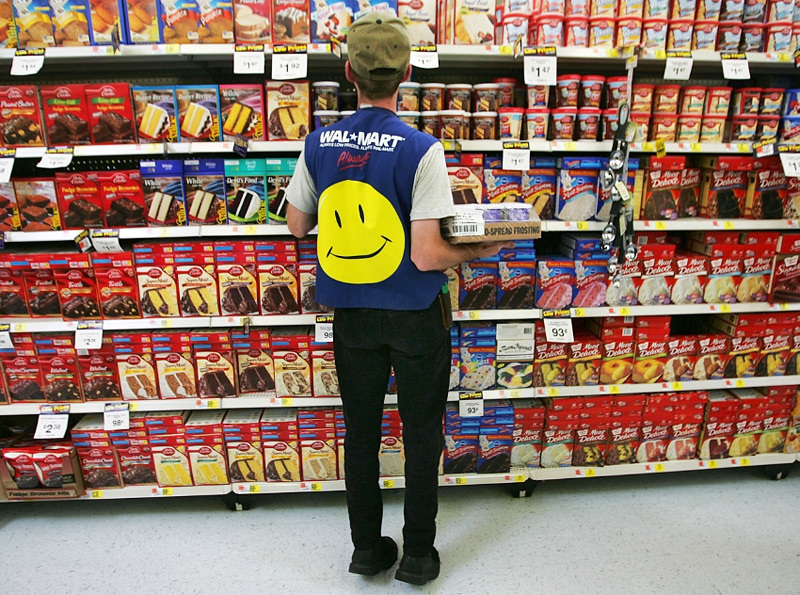 Would raising prices a few percentage points break Walmart? Their own workers can barely afford to shop there. They tend to shop at dollar stores which are further downmarket. With higher wages more Walmart workers would shift to shopping where they work, and the whole wage increase would turn out to be a wash. What goes around comes around. Even the folks who own WMT would do better paying a higher wage. Still, the main argument for a high minimum wage is that it encourages economic efficiency. When wages are low, there is no point in introducing labor saving equipment or techniques. Why invent a dish washing machine that costs $5/month to finance when you can hire a dish washing person for $4/month? The US has had flat or declining wages for decades now, and we’ve seen falling investment and TFP as a result. A modern nation needs wage pressure to get wealthier in terms of producing goods and services. The US has vast amounts of capital inflating the prices of rent producing assets like select real estate, corporate prices and art objects. Unlike slightly higher prices at Walmart (and elsewhere), these price increases do nothing for the actual wealth of the nation. In fact, they can be detrimental. The tsar didn’t free the serfs out of the goodness of his heart. The tsar saw how badly a peasant army fought and realized that Russia needed a more modern social structure. A medieval society could not produce soldiers or weapons. While the profit margin on serfdom was high, it had a societal cost that even a not very bright medieval autocrat could understand. Sometimes you have to take the road away from serfdom, not towards it. I really liked your Ribbonfarm piece. But after reading this i’m thinking the photo of you upside down on the stripper pole looks like a reality-inverting audition for the U.S. Chamber of Commerce’s Corporate Victimization Unit.